As expected I did very much enjoy this. I love the idea of transformations like the ones in this (telegraphed right from the start) and wasn’t disappointed with them. The book went from a bit of genetic manipulation to quantum mechanics and rewriting the laws of physics, with an interesting spin on how those laws are formed. It also dealt with immortality, and I’m a sucker for that. One teensy little problem, however. This book suffers from what I’ll call ‘the slide rule effect’. 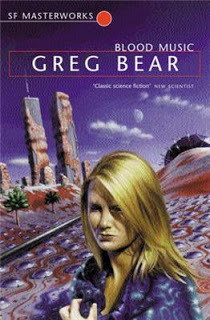 Some of the older readers here will know exactly what I’m talking about: those old SF books with grand-scale sensawunda in which the astrogator works out the course of the superluminal starship using a slide rule – some anachronism that takes that vital ‘suspension of disbelief’ a step further away. All the way-out (or not particularly way-out) science in this is fine, but that a large part of the story takes place in the Twin Towers does bugger it up a bit.